WinADay Casino’s last jackpot winner has hardly had time to spend her win and it's paid out again already! Marsha G. recently won $131,508 playing one of the unique instant play casino’s original games, Wheeler Dealer. Just a few weeks ago one of WinADay’s newest and most popular slots paid out one of the casino’s biggest jackpots ever when Alfred F won $213,367 playing Alice in Wonderland. That followed a nearly quarter million dollar win by Taryn L. on Leprechaun Luck and Vera M.’s record-breaking $255,462 jackpot on Chinatown. Marsha said she doesn’t normally play the premium slots much. She likes the bonus features and amazing graphics and sound effects in games like the new Haunted and Dollar Storm but simpler games like WinADays eleven penny slots are more her style. Wheeler Dealer, one of the games WinADay opened with seven years ago, is an eight pay line slot game where a greedy animated businessman grumbles each time the game pays out. 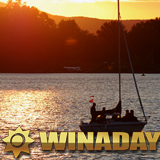 You'll earn Comp Points when you play at WinADay and they can be converted into cash rewards. VIP players earn up to triple comp points. This is a good time to check out WinADay Casino since their Easter Slots Tournaments will continue awarding nearly $500 in prizes every day until April 27.